FL Governor Ron DeSantis announced portions of his education plan in Tampa Wednesday. Even with a relatively strong economy, the number of high-growth, high-skill, high-paying jobs in Florida isn't where lawmakers like Gov. Ron DeSantis would like it to be. In part, that's because the state doesn't have enough people qualified for those careers. "We actually have people coming from other states to fill some of these jobs, and that's a good problem to have cause the economy's going good, but I think that we want those jobs filled by Floridians," said DeSantis. Florida is 24th in the nation in "workforce education" – the number of adults who have an associate's degree or a workforce certification in a trade. DeSantis announced an executive order in Tampa Wednesday that has a goal of getting the state to the top of that category by 2030. "We want to be nimble, we want to be responsive to how the economy changes and we're in an era where there's a lot of rapid change in the economy, so we want to make sure that we're going to be able to respond to that,” said DeSantis. Speaking in a welding shop at Tampa Bay Tech High School, DeSantis said he’ll have Department of Education Commissioner Richard Corcoran ask the state legislature for $10 million in seed money for workforce apprenticeships and another $26 million for workforce education programs housed in the Florida College System. 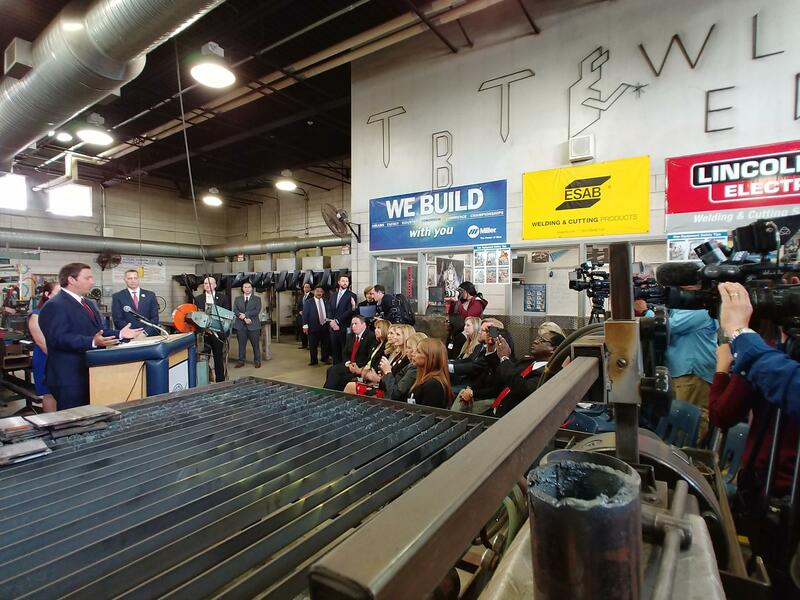 Speaking in a welding shop at Tampa Bay Tech High School, DeSantis announced plans to seek $36 million in state funds for ask the state legislature for $10 million in seed money for workforce apprenticeships and workforce education programs. The order also directs Corcoran’s department to perform an internal audit of its career- and technical-education programs and to coordinate efforts with the state Department of Economic Opportunity, Florida’s school districts and private businesses to ensure students are trained to meet market demands. “I think looking at the (economic) needs of the state and then crafting our educational opportunities to reflect that and to fulfill that makes sense,” DeSantis said. Computer science is also a major part of the governor’s education plan. He’s asking lawmakers to look at making high school computer science classes count as a science requirement toward graduation. At the announcement on Wednesday, DeSantis also faced questions about a backlog of teacher certifications. In the 2017-18 school year, the state's Bureau of Educator Certification issued 31,397 educator certificates, 55 percent fewer teachers than were certified a year earlier. A new certification system slowed the approval process, leading to the decline. Hillsborough County School Superintendent Jeff Eakins said he understands teachers' frustrations. "They want to have the confidence that when they do their part and they take care of their training, that ultimately the state is going to process their certification and that's going to come back to them,” he said. DeSantis said Corcoran is addressing the problem a number of ways, including by adding six staff members to the Bureau of Educator Certification. He’s also allowing superintendents like Eakins to put in a list of priority applicants. "Our goal is to make sure that these programs are working well, to have good teachers and then to keep teachers in the classroom and that's what we're going to be focusing on," said DeSantis. DeSantis will announce more of his education plan next week, including incentives for teachers who want to work in underserved areas. Not every high school student wants to or even needs to go to college, but graduating students without a college degree may have a hard time gaining entry or experience at companies hiring for high paying, high skilled jobs. A local program is trying to bring that experience to graduating students. Republican gubernatorial candidate Adam Putnam is rolling out details of his top priority if elected — a plan to boost vocational and technical education in middle and high schools.